One of the most remarkable interpreters of her generation, Claire Désert entered the Conservatoire National Supérieur de Musique de Paris when she was just 14 years old. After studies with Ventsislav Yankoff and Jean Hubeau, she received premiers prix in piano and chamber music. After admission to the postgraduate cycle, she was granted a French government scholarship to study for a year with Evgeniy Malinin at the Tchaikovsky Conservatory in Moscow. Upon her return, she completed a second postgraduate year in chamber music with Roland Pidoux. 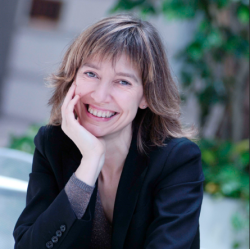 In addition to numerous solo appearances at international music festivals such as Radio France Montpellier, La Roque d’Anthéron, Piano aux Jacobins, Piano Lille Festival, ‘Folles Journées’ in Nantes, Bilbao, Lisbon and Tokyo, Claire Désert also often appears with Orchestre de Paris, Orchestre national d’Île-de-France, Orchestre philharmonique de Radio France, Orchestre symphonique de Québec, Orchestre philharmonique de Strasbourg, Orchestre National de Lille, and Budapest Symphony Orchestra. A keen chamber musician, she regularly partners such eminent artists as Emmanuel Strosser, Anne Gastinel, Philippe Graffin and Gérard Caussé, as well as the Quatuor Sine Nomine and the Quintette Moraguès. Her impressive discography includes the Scriabin and Dvorak concertos with the Orchestre philharmonique de Strasbourg (which received a French ‘Victoire de la Musique’ in 1997), a Brahms programme for two pianos with Emmanuel Strosser and three programmes with the cellist Anne Gastinel. 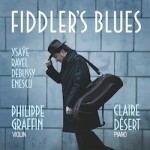 Recent releases include Schumann’s Davidbündlertänze, Dvořák’s Slavonic Dances for piano duet with the pianist Emmanuel Strosser, and Abendmusik, a solo album dedicated to Clara and Robert Schumann and Brahms. Her latest recording, of Schumann’s Fantasie Op. 17, Romances Op. 28 and Waldszenen, was awarded a Choc-Classica, a Joker by Crescendo Magazine and a Supersonic by Pizzicato.